I saw a video of this girl taking out her glider at target. I know you should not do this(while this video is still humorous); but will it glide away from you, even if you are extremely bonded to it? I'm not really sure I understand your question. Will a bonded glider leave you at any time? (run, jump or glide away) - if that is what you are asking then, yep, absolutely, if there is somewhere they want to go or something they want to check out. My 10 yr old will sit on my shoulder happily if there is nothing around that particularly catches her attention, but if something peaks her interest, she will head off to check it out. I can also hold my arm out and (if she is agreeable, lol) she will jump off my hand in whatever direction I aim her...it usually works best if she knows what to jump to although she has also been known to just take a flying leap to the floor if she can't figure out where I'm trying to send her or she miscalculates the jump, lol. bonded (for me) isn't about them never wanting to be on anything but you, it's about having a relationship where there is mutual trust and understanding. While none of my gliders will stay on me only (a couple just don't like to ride around on mommy very long, so are always off trying to find their next adventure), all of them watch me and make sure they know where I am in a room and come back and check in with me. 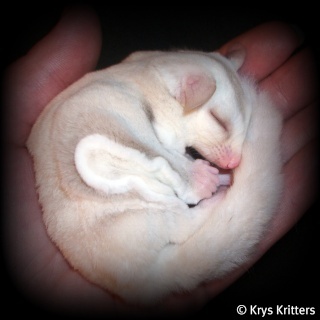 Almost all of my gliders (one really likes to play and run and never wants to go back to his cage, so he is my sometimes exception) will take my hand if I offer it to them. They trust that I won't chase or grab them, so when it's time to 'hop up' I can go over to where they are playing, offer my hand, arm or shoulder and they will climb on. To me, my being calm and direct (no grabbing or chasing) shows them that I trust them and their taking my offered hand shows me they trust me. Yes, a glider can and will bolt from you, even if "bonded." They are also deceptive in a way, because during the daytime they are often sleepy and move slowly, almost in a sloth-like fashion. Do NOT let this fool you or give you a false sense of security. They are more than capable of rocketing off. They can jump off you and hit the ground running. Honestly this video makes me nervous. That glider could've climbed to the top of the aisle shelves... what then? Or gone under something, or gotten lost, or stepped on, or or or. It's just a disaster waiting to happen. Now I fully admit that I had a bad experience with my very tamest, most people-loving glider rocketing out of a bonding pouch with no warning or reason and almost getting lost forever, so I am borderline neurotic now and don't take my babies anywhere but to the vet. But better safe than sorry, I say. 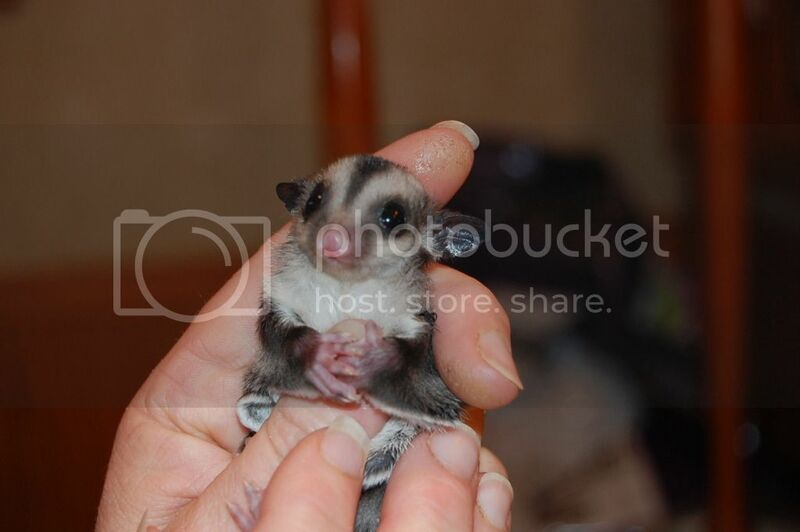 Sugar gliders are exotics. Yes, they will take off even if they are bonded to you. Heck, even dogs run sometimes and they are domesticated. I have a bit of an issue with her letting the glider crawl around on things that she isn't even buying. Sheesh, it is a whole male who could easily pee, poo and mark whatever he is on. IMO, not the coolest thing to do in a store. I wouldn't want him out like that because there are some many places he could get into and get hurt or, like was mentioned lost. I agree.. Any animal is capable of doing this I can't imagine loosing my gliders, so i do not let them roam too much unless they are in a closed room and their tent. I have only taken them outdoors a couple of times and with a close watch! Anyone, even humans, can panic and act in ways that are dangerous. When we had fire-drill training at Discovery Zone (anyone remember them?) we were taught that kids will hide when they are scared, and even some adults will panic and hide as well. Even though they know they must leave for safety's sake. So even the most bonded glider can get frightened and jump to what they perceive is a safe area and take off. I love the point you made about her letting the glider climb around of stuff she isnt purchasing. What if someone else who had a sick glider did that and then she lets her glider climb on it and it got sick. Will a glider take off and head for parts unknown? You betcha they will. They aren't a domestic animal and even if they were they'd still do it! bonding is just building a trust between you and your pet. They aren't real high on any IQ chart so you have to take that into account. You're lucky if they will come to you when called by their name. What about if someone reported her... 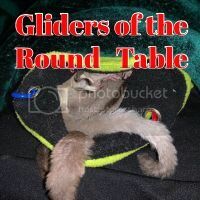 Honestly how many people assume gliders are rodents? Alot! I realize she probley just could have been asked to leave but what if there was more.... Could the store have fined her? The only place I take a glider out of the bondbag is the vet's office inside the secure exan room! I don't think she intended to be reckless... I just think she did not think it through. There was a lot wrong with that video. The hat was so not safe for the glider. The girl was forcing the poor little guy to come out of the hat when he just wanted to stay safely tucked away. Now however I do want one of those cute tiny tents....those were adotable...lol. I completely agree with lilangels. There was a lot wrong with that video. Last edited by Abbey; 11/03/11 11:25 PM. Makes me wonder just how bonded he was to her and she to him. She seemed really uneasy having him on her and handling him - she even mentioned at one point she didn't want him to bite her. He seemed more scared than anything. It also reminds me of the time I was going into Target and had my suggies in their pouch down inside my purse and didn't have the pouch closed. As soon as we hit a couple bumps they came flying out of my purse and started crawling around the cart. Freaked me out! I scrambled as fast as I could to get them back into their pouch because I knew they could get loose at any second. I have not made that mistake again! Much like a dog, a sugar glider can take off in an instance. My dog Athena is 11 years old and very obedient. But if I have her outside w/o her leash on and she sees a squirrel or another dog and I don't react fast enough to deter her attention, off she goes. I think any animal, regardless of the bond or their intelligience, needs to given extra special supervision outside the comfort of their home. I had two gliders both female. They were well bonded to myself and my wife. They would ride on our shoulders all the time. We would walk outside in the mornings to get the paper. We had done this many times. One day MY girl jumped off and in two bounds went up a 50' pine tree. We have quite a tree covered area and I have never seen her again. I spent two full nights in the woods. Put a cage out with food and sleeping pouches, but she never came back. I waited a couple of months but the other one was very dispondent and lack-luster so I finally went and purchased another girl as a companion. Both are now happy and bonded again. BUT !! THEY WILL NEVER GO OUTSIDE AGAIN. I get up with my friends at 5:00 AM every day !